I have memories of riding in the backseat of the car while my family was traveling listening to “A Prairie Home Companion.” I didn’t always get the humor (some things were more funny to a little kid than others), but I always enjoyed listening to Keillor’s storytelling ability (especially during the private eye skits) and hearing the tales of that the fictional town of Lake Wobegone, Minnesota, “where all the women are strong, all the men are good-looking, and all the children are above average.” At any rate, my parents thought he was hilarious. 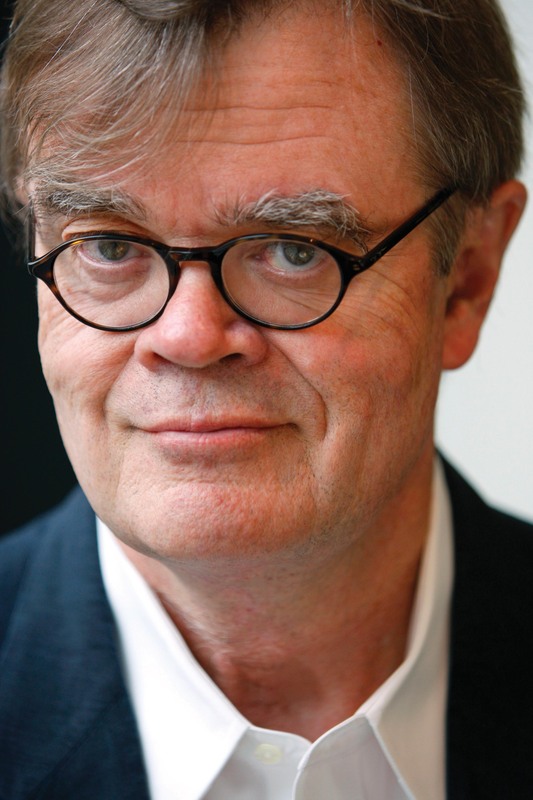 Keillor grew up in the town of Anoka, Minnesota, which in many ways was the inspiration for Lake Wobegone, and graduated from the University of Minnesota. While there, he began his broadcasting career on the student-run radio station that is known today as Radio K. Keillor went on to host a morning radio show on the Minnesota public radio station and also began writing fiction for The New Yorker. Keillor resigned from the morning program for a short time, citing creative differences over musical selection, but returned later that year, and the show was called “A Prairie Home Companion” upon his return. The show did its first evening broadcast on July 6, 1974 with variety show style in front of a live audience. In addition to his popularity as a radio personality, Keillor has written articles for newspapers and magazines as well as books for children and adults. He’s done voiceover work for commercials and the Ken Burns documentaries The Civil War and Baseball, and he wrote the screenplay for the film, A Prairie Home Companion. In November of 2006, he also opened a bookstore called Common Good Books, G. Keillor, Prop. in St. Paul Minnesota. Keillor has had a long and eclectic career in the broadcasting and writing world, and with 4 million people listening to A Prairie Home Companion each week on more than 600 public radio stations, it’s still going strong. We’ll be getting together on Thursday, February 9 at 7 p.m. at Paradise Bakery and Café at Hamilton Town Center to discuss Happy to Be Here. Whether you have fond memories of “A Prairie Home Companion” and appreciate Keillor’s style, or can’t understand why your parents think he’s so funny, it’s sure to be a lively discussion. We hope you can join us! In the meantime: What have you thought of the book and Keillor’s style so far? Have you ever listened to “A Prairie Home Companion,” and if so, what did you think? Haha! I agree there is a resemblance! I remember the same long car rides listening to TPHC from the back seat too. I didn’t always get or laugh but he does have a great knack for story telling and excellent radio voice!